May be if our stand-up comedians had been left to themselves minus a bungling director they would have delivered the gags better. Assemble the best comedians on one platform, choose a script that gives them scope to display their inherent talent, garnish it with witty one-liners, borrowing names and references from real life to make it look contemporary. 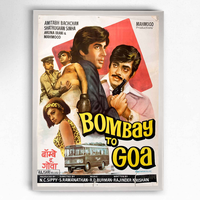 This film tells us about a bus ride between Bombay and Goa and the adventure that the passengers undertake. Overall Bombay to Goa is a decent entertainer. But the length of the film could go against it. The Great Indian laughter challenge finalists are in form and they make the movie worth a watch.